This is the last of Verne’s Extraordinary Voyages to be translated into English. Nine laureates of the Antillean School are awarded scholarships, which their benefactor, Mrs. Kathleen Seymour of Barbados, wants them to use for a trip to visit the islands known as the Antilles. With three hundred and fifty islands in this region, the voyage will be limited to the Windward Islands where the students were born, including the English islands of Saint Lucia, Dominica, and Antigua; the French islands of Guadeloupe and Martinique; the Danish islands of Saint Thomas and Saint Croix; the Swedish island of Saint Barthélemy; and Saint Martin, owned half by the Netherlands and the other half by France. Accompanying the young men on this trip is the school’s Latin phrase spouting bookkeeper, Mr. Patterson. The journey across the Atlantic begins, but unfortunately for them, the ship they’ve been traveling upon, the Alert was commandeered by a group of criminals who had initially planned on dispatching the boys early into the voyage. The pirates decide to keep them alive when they learn the students will be receiving 700£ each when their tour of the island reaches the final island of Barbados. For the pirates to be able to complete their mission they will have not be caught and for the students to survive they need to discover the true identities of the Alert’s crew. Translator: Teri Hernández. Introduction: Volker Dehs. Editor: Arthur Evans. Middletown, CT, Wesleyan University Press, 2013. 424 pages, ?? ill.
Get the hardcover at Amazon.com or Barnes & Noble. It was a shame nonetheless. Even in his seventies Verne was the craftiest of old pros, a tale spinner with a huge bag of tricks, and “Travel Scholarships” shows him in solid form with one of his specialties. Published in Paris in 1903, this is the last holdout among his untranslated novels, and it’s one of Verne’s slickest, shrewdest sea stories. The yarn is laid in the 1870s and begins in the British Isles: escaped convicts hijack a charter cruise bound for the West Indies. The vessel’s passengers are nine lads ready to come of age, student winners of a summer trip to select islands in the Antilles; their adult protector is the school’s bean-counting bursar. The runaway thugs scheme to murder them all, plunder their scholarship money, and lead a life of piracy in the Pacific; but they need to move cautiously, playacting as good guys and able seamen. Verne was a yachtsman for much of his adult life, so his sailing scenes have color and authority, plus he mixes in a variety of other attention-getting ingredients: low comedy, plot twists, word games, fascinating factoids, mysteries that keep piling up - all of it leading to a scary open-boat journey and a ferocious climax in the mid-Atlantic. Yet, though his overall tone is upbeat and theatrical, there are undercurrents. One ethical issue here often rears up in Verne’s fiction, his longstanding hostility to colonialism, and this little-known tale features one of his slyest pieces of dramatized satire: students from Britain and France squabble (p. 222) over which of their nations owns the isle of Saint Lucia in the Lesser Antilles. Their verbal ping-pong (wittily caught by the translation) is a cagey metaphor for the back-and-forth fortunes of this island, which changed hands countless times between the two old rivals. 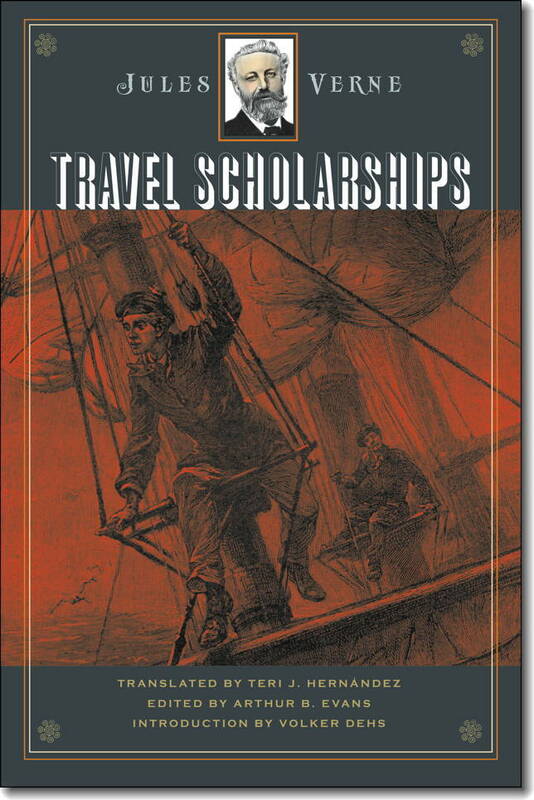 “Travel Scholarships” is the 31st volume in Wesleyan’s series Early Classics of Science Fiction, also the last of four Verne novels that didn’t appear in English till this publisher took charge. As edited by Evans, the translation by Teri J. Hernandez is an easy read, often catches Verne’s humor, and rises to real thrills in the stormy climax. Like other titles in the series, this is a seven-course critical edition - it has an introduction by overseas Verne scholar Volker Dehs, 30-plus pages of provocative endnotes, a succinct biography of Verne, an up-to-the-minute bibliography, and all the wash drawings and photos from the original French edition. Verdict: a stirring sea story with literal depth … also splendid accessories, a quality cloth binding, and a startlingly reasonable price. Click on that yellow bar up there to the right (on Amazon website). -- Posted by Frederick Paul Walter, “STIRRING SEA STORY”, on Amazon July 3, 2013.